This spring, expect to see an abundance of pastels, some questionable choices in footwear, and even more questionable choices in bags. From asymmetrical necklines to embellished straps to simple white tank tops, everyone will surely find something they love in this spring’s newest trends. In terms of streetwear, the styles of the 1990s and 2000s are slowly but surely making their way back into mainstream culture. Ruched dresses, tiny sunglasses, plain white tanks, and slip dresses are finding their way back into our current fashion trends. For those who steer clear of the high fashion look and want something more casual, cargo pants, crop tops, and white sneakers are the perfect 90s styles which are back for this spring. These trends are everywhere, spreading throughout the world like wildfire. The Versace Spring 2019 Ready-to-Wear Collection by Donatella Versace really stood out to me. And not in a good way. I managed to find a few acceptable pieces, like the variations on the “little black dress” and the leather jackets, but despite these few pieces, I would say the collection was probably one of the worst this spring. The pieces were so colorful and so many patterns were mixed together to the point where it became too confusing to watch. When it comes to fashion, my advice is either do something no one has ever seen before or do something classic and timeless. Throwing together random patterns does neither of these for me. All in all, the silhouettes were good, but the textiles… not so much. 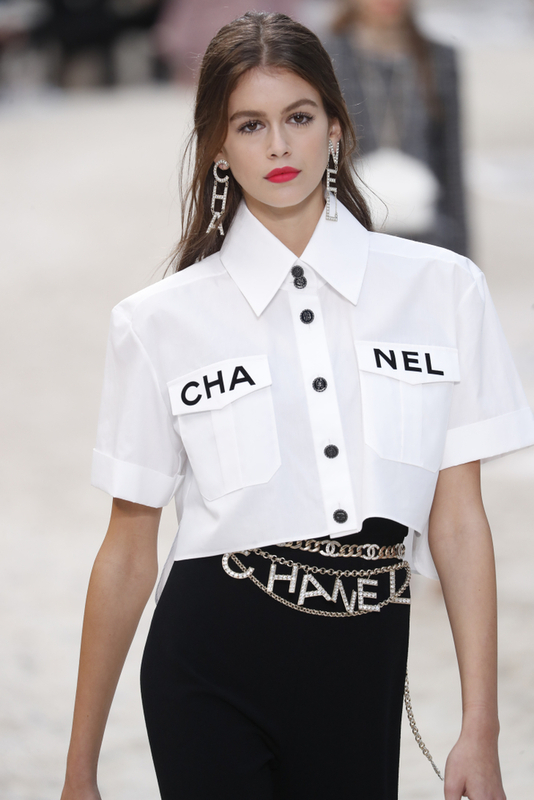 The Chanel 2019 Couture Collection was, as always, absolutely stunning. A timeless collection that featured stunning dresses, tweed skirts with matching jackets, and much more. This collection takes a step away from the complicated nature of today’s fashion, and a step toward simplicity and classic beauty. Karl Lagerfeld, who had been Chanel’s Creative Director since 1983, recently passed away. Luckily, he still had enough time to put together a few more collections so we could get one last look at his brilliance. The Balmain 2019 Couture Collection was not only great, but also a new direction for Olivier Rousteing. Balmain is known for its edgy, glamorous style, but in this collection, they took a brand new approach. The collection featured soft, pastel fabrics which were balanced out perfectly with the complexity of the designs and structures. This said, there were a few pieces that I just could not bring myself to like. For example, a dress with a skirt so structured that it looked like one of the paint rollers you’d find at Home Depot. Seriously, the skirt looked like it was made from cardboard. But, despite the few flaws of the collection, I did enjoy the overall aesthetic and the majority of the pieces. Like all good things, spring fashion has some major downfalls. Clear PVC boots serve as a perfect example of this. Not only do I find them hideous, but also just unorthodox. The idea of wearing PVC boots, allowing the world to watch your feet sweat, has become the subject of my nightmares. Next, we have fanny-packs, yet another recurring nightmare of mine. Believe it or not, there was a time when fanny-packs were meant to be worn by middle-aged women who wear capri pants and bedazzled shirts. Now they’re everywhere and there’s nothing that can be done to reverse the damage. The students of NHS are also excited for spring fashion. Gianna Santangelo, a NHS freshman, says, “I’m really excited to wear denim shorts, cute tops, and sandals. I feel like in the winter, we all wear the same things. In the spring we can be a little more creative.” She is excited to show her individuality through her clothing this spring. This spring’s newest fashion trends are (for the most part) very promising. We’ll surely be seeing modern spin-offs of vintage styles, intricate designs, beautiful patterns, and most of all, horrifyingly ugly fanny-packs. I’m not kidding. Stop with the fanny-packs. Despite this error in judgment, I think we can manage to pull some great looks from this spring’s trends. Your teacher starts a discussion about current events and a recent issue regarding governmental affairs.